Lower fat baking is always a little bit tricky because you don’t really want to sacrifice flavor and texture for a “healthier” cake. Experimenting to come up with just the right “lighter” recipe can take quite a bit of time. 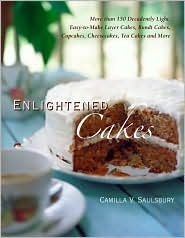 One way to streamline the process is by getting a cookbook that has done the work for you, like Enlightened Cakes. 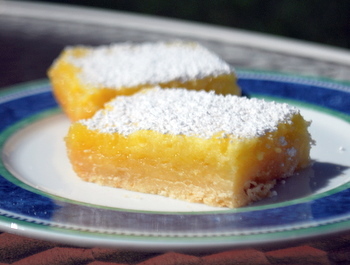 The cookbook is dedicated to cake recipes of all kinds, and each recipe is lower in calories than the “regular” versions and none of them have more than 10 grams of fat per serving. The book covers bundt cakes, layer cakes, cupcakes and cheesecakes, as well as frostings and all the other extras that go into making a cake. There is a tremendous variety in the recipes, from classics like New York Cheesecake, Texas Sheet Cake and Pound Cake, to more unusual treats, like Chai Cupcakes with White Chocolate Cardamom Frosting or Chocolate-Lavender Layer Cake. Careful testing went into all the recipes, and the reason that they are lighter than some of their counterparts is primarily due to the author’s judicious use of butter, oils and sugar, rather than using substitutes (fake sugar, etc.) to replace them and risk changing the texture of the cake. She uses lower fat or fat free dairy products in a few recipes, as well. Many of the recipes also include whole wheat pastry flour, or use it in combination with all purpose flour to add some whole grains into the mix. She incorporates lots of flavorful elements like spices, nuts, cococa powder and chocolate to make sure that the “enlightened” recipes don’t dissapoint when it comes to taste. Of course, the book also includes selections that are always low in fat and would turn up much the same way in any cookbook, like Angel Food Cake. The recipes are straightforward and easy to follow, and it is easy to see where you could make your own substitutions if you don’t mind a few extra calories here and there (e.g. regular graham crackers instead of reduced fat for a cookie crust). There aren’t many pictures, but the recipe titles are descriptive and it doesn’t take much imagination to picture what the finished cakes will look like when they come out of the oven. This looks like an interesting book. Have you made anything out of it that you liked? I’m always on the look out for ways to cut out unnecessary calories without sacrificing flavor or texture but in baking I’m hestitant to mess around too much lest I totally ruin the cake. I’m a huge Camilla Saulsbury fan. I have several of her cookbooks. The first recipe I made from this book – a vanilla buttermilk cake – turned out light, moist and delicious. Served with strawberries, it was light and satisfying dessert the whole family enjoyed for less than 200 calories a serving.